Apostle J. Rodney Roberts is the Senior Pastor of Five Porches Of Deliverance Centre Apostolic Tabernacle, President of Circle Of Deliverance, Chairman of the Apostolic World Christian Fellowship Bahamas Branch and the founder of J. Rodney Roberts Ministries. Apostle Roberts, who is entering his 33rd year in Kingdom Ministry, resides in New Providence, Bahamas. He is a master prophet, prophesying throughout the Bahamas, the Dominican Republic, the Republic of Haiti and the Continents of the World, declaring a message of consecration, holiness, and total obedience to God. 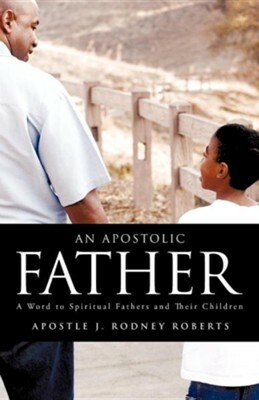 In "An Apostolic Father," Apostle Roberts shares from his heart and his life experiences as a spiritual father in ministry. His story, woven into various scriptural accounts of spiritual fathers and sons, encourages both fathers and sons in ministry to maintain relationships and see lives blessed, impacted, and changed. This is a balanced view of ministry that speaks wisdom and understanding into situations of possible disconnection in Ministry. Sons, read this book with a heart desiring God's will for wholesome relationships in your lives and the lives of others with whom you come into contact. Fathers, read this book with a heart willing to mentor and care for your sons and daughters according to the will of God. I'm the author/artist and I want to review An Apostolic Father.